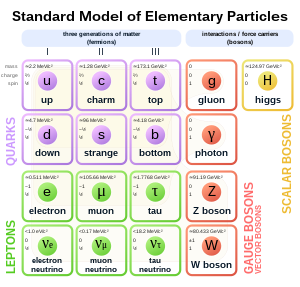 Elementary particles included in the Standard Model. In particle physics, an elementary particle or fundamental particle is a particle whose substructure (domain of the bigger structure which shares the similar characteristics of the domain) is unknown, thus it is unknown whether it is composed of other particles. One of the most natural questions when one looks at the mass of uncorrelated data on elementary particle interactions is whether a systematic pattern is emerging from this complexity. The penetration of controlled laboratory experiments into the multi-Bev energy region can only make such a question more acute. This page was last edited on 9 October 2017, at 13:21.